Any transport company worth its salt makes sure to be versatile enough when it comes to being able to deliver items for its customers. The geographical range involved will usually span far beyond the borders of a state or region and often encompass different points across the world. For those seeking a carrier in the area of bulk liquid transport, there are certain rules and regulations that differ from standard operations. This is especially true when it comes to transporting vegetable oil, which has to take into consideration laws focused on protecting marine life in the event of spills taking place during an overseas shipment. Staying current on vegetable oil transport laws is what separates the quality bulk liquid transport companies from their less-equipped competitors. The age of a ship might not seem terribly important to a customer, but companies handling the shipping of vegetable oils have to factor in such concerns due to specific legislation crafted by the United Nations. 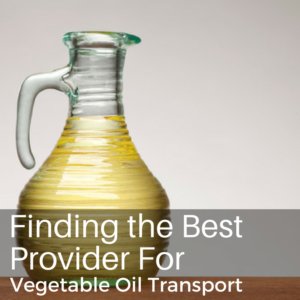 Other vegetable oil transport issues can be connected to the delivery mechanism being used or the steps being taken to avoid any compromising of the product. One important step forward within the past decade in this segment of the industry has been the introduction of Flexi-Tank technology. In this instance, bulk liquid transportation concerns can be addressed in a space-saving manner that also prizes convenience. Prior to this being brought into the marketplace, companies were saddled with additional costs for transporting vegetable oil. This problem was due to the limited delivery options that weren’t engineered to make use of the available space in that transport. Initially, the reluctance to take advantage of this technology was based on the mistaken belief that such flexibility was prone to easy punctures or other damage. That’s proven to be false, mostly because the use of a forklift isn’t required. As a result of the rapid adoption of this particular option, it’s become an important consideration in the quest to bolster a company’s bottom line. In addition, the actual location on shipping vessels for such items tends to be an important facet of the transportation component because of those same rules. A lack of awareness when it comes to these matters can potentially lead to damage or ruin a product, with eventual delivery also in question. Discovering these issues after the fact can prove to be a frustrating endeavor, especially for the customer. The long journeys that such products take can make customers nervous about exactly where such items are at a particular time. Companies with a solid background in this area make every effort to alleviate those worries by equipping orders with technology that uses satellites to remotely monitor the general location of an order. Known as Loadtracker, this technology has become a standard in the industry. That’s because besides zeroing in on location, a sudden change that could affect the product can be immediately detected and addressed. One of the more basic components of any company tasked with delivery of vegetable oils or any other product should be a firm commitment to cleanliness. This should never be open to question, yet some companies can seek to cut corners in order to save some money. In the end, all they do is see the fabric of their business model get chipped away with each passing day. The necessity of following the rules when it comes to transporting vegetable oil can be seen from the sheer scope of how much products that are using it impact the world’s economy. This specific type of bulk liquid transport brings with it certain responsibilities that a provider has to consider. Kan-Haul has been in the transportation business for the last three decades and takes the issues affecting vegetable oil transport seriously. So when the time arrives to choose who can best handle the job, make sure to contact us to get things moving.